There are many reasons why Honey Creek Candles are the best burning candles around. My 40 years of experience has taught me the tried and true method to designing beautiful, hand-carved, candles that will last years to come. I would like to take you through the process and tell you why each step is so very important for a long lasting; clean burning; washable and refillable Honey Creek Candle. Of course I cannot “reveal” a few secrets I have but you will certainly understand why a Honey Creek Candle will make for a long burning candle for home or as a quality gift for that someone who has everything; or who is celebrating a marriage, anniversary or just having a romantic dinner with their favorite someone. Why Honey Creek Candles ? I start with only clean, clear, top quality paraffin wax. It is a very high melt point wax which is why they burn so evenly and glow with such beauty. I never use any “discarded” wax created from any errors that may occur in the process; if this happens the wax is discarded, never to be used in a Honey Creek Candle. I also use only unbleached, cotton braided wick which has no toxic fumes, lead, or smoke and is easily trimmed by touching with finger. I add stearic acid to the wax in both the core and the colored dipping wax. This helps make the wax harder and keep your colors bright for many years. After the candle is carved and hardened, it is then cleaned of any debris and a glaze is applied. This glaze makes the candle durable and allows any dust that may settle on the outside of the candle to be wiped off with a damp cloth; therefore always looking bright and radiant. 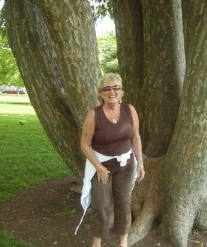 Learn more about, owner and carver, Pam and how Honey Creek Candles started! 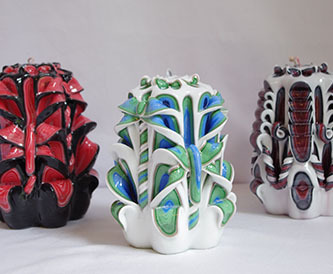 Interested in learning more about our hand-carved candles? Our candles are made from the highest quality paraffin wax, and are designed to last for years to come! Candles can be customized to order, but we offer an already wide assortment of candles available in our online store!